My first thought was of flowers, but as this piece came together, the dazzling sparkle from the Swarovski crystals reminded me more and more of stars, especially the brilliance that we see in the winter skies during the long New England nights! My thanks go out to Artbeads.com for supplying the glorious crystals that made this piece possible. 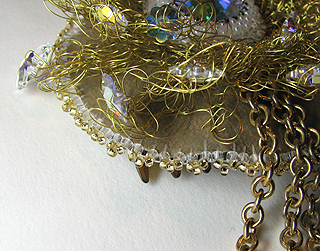 I bezelled the 18 mm Rivoli with seed beads, and used three different sizes of Margaritas (6, 8, and 10 mm) on 32 gauge gold-colored wire to crochet the centerpiece. 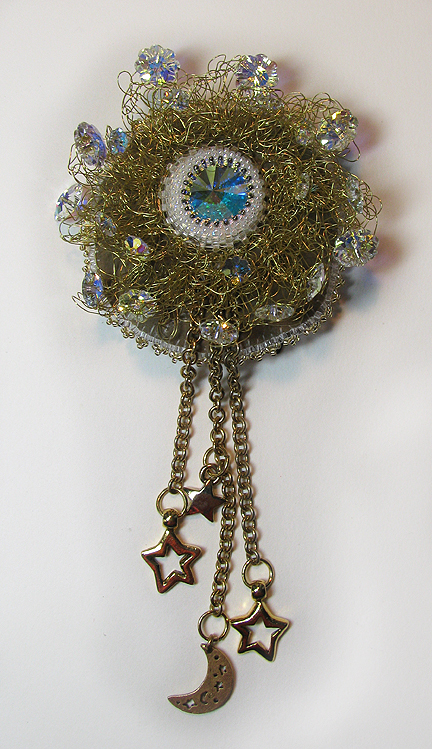 Although I was originally thinking about making a pendant from it, it ended up becoming a hair fascinator instead. Have you heard of these? "Fascinator" is just a newer term for a hair thingie...attached usually by a comb like I used, but sometimes with a barrette or head band instead. 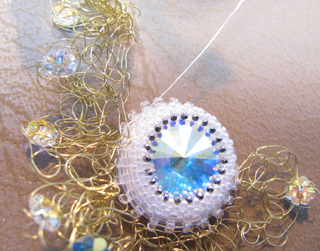 As regards FTC disclosure guidelines: I have received the Swarovski beads and Rivoli free of charge from Artbeads.com in order to create a project free of charge for you. I have not been paid for my endorsement as it pertains to the products received. Thanks as always for your great tutorials! You always have great ideas and do a great job demonstrating how you take your idea from concept to finished piece! Aren't you sweet! I don't feel like I really gave a whole lot of details on this one, but so much of the info can be found in my free e-book that I don't want to keep repeating myself!! what a unique and beautiful design! very nicely done! It's beautiful. I can't get over how you crochet with wire. It creates such a unique effect. "Hair fascinator" - that's a new one on me. It reminds me of the colors in "Starry Night"! That is incredible! Thanks for sharing about it.